There are few meals that I prepare that we all agree are amazing like this Jalapeno Popper Grilled Cheese! I love it because it is easy peasy with little clean up. Everyone loves it because these sandwiches are delicious and oh so filling. From the creaminess of the cream cheese, the crispiness of the bacon, to the little kick from the jalapenos; this meal will get everyone talking. These are also great to cut into finger sandwiches for a party. We are having karaoke night at our house in a few weeks and I am going to make a grilled cheese tray. I’m going to make some homemade ranch dressing to dip these babies in and WOAH, it will be a PARTAYYY! I hope you will give these a try and let me know what you think. Carefully slice and remove seeds from jalapeno peppers. Slice the peppers lengthwise and place on baking sheet lined with wax paper. Bake jalapeno peppers in oven preheated to 400 degrees for 6-8 minutes then carefully remove from oven and set aside. While jalapeno peppers are cooling, prepare bacon as directed on the package or as you normally would. We like it crispy. Spread one side of one side of bread generously with cream cheese. Place 4 jalapeno slices on top of cream cheese. Place 4 slices of bacon on jalapeno slices. Place a few slices of cheddar jack cheese on top of bacon and top with second slice of bread. Spread about 1 Tbsp butter on outside of top slice of bread and place in pan, butter side down. “Grill” on medium low for about 5 minutes or until golden brown. While the first side of the sandwich is “grilling”, spread 1 Tbsp of butter on outside of other side of sandwich. Once the first side of the sandwich is golden brown, flip to the other side with the butter on it. Continue “grilling” for 5-7 minutes or until golden brown. Carefully remove from heat and place on plate to serve. These look delicous! I can’t wait to try them. A nice addition might be to add some ranch dressing mix to the cream chesse. When I make poppers, I add the ranch mix and it gives them that extra tangy kick. Yummy! Thanks for sharing. Love this idea! Grilled cheese are one of my favorite comfort foods and I love everything spicy. 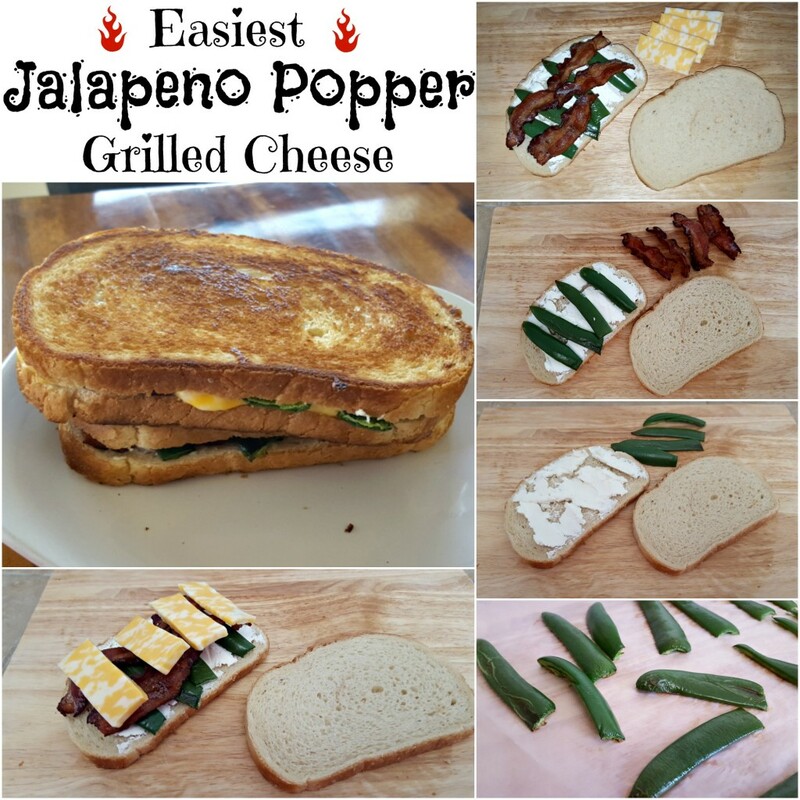 We still have a few jalapenos from the garden so I may give this a try today! Thanks for sharing! I love your kicked up Grilled Cheese, it looks so good! Hope you have a great week and thanks so much for sharing with Full Plate Thursday.